Rama's brother Satrughna is returning with his attendants to Ayodhya from his kingdom of Madhu for the first time in twelve years. He visits Valmiki's hermitage where he hears Lava and Kusa (the twin sons of Sita and Rama) singing the story of Rama. One of the remarkable initiatives underway at the British Library is the digitisation of their special collection through the project Turning the Pages™, which aims to make available some of the rare and extraordinarily valuable books usually reserved for viewing by conservation specialists and researchers. 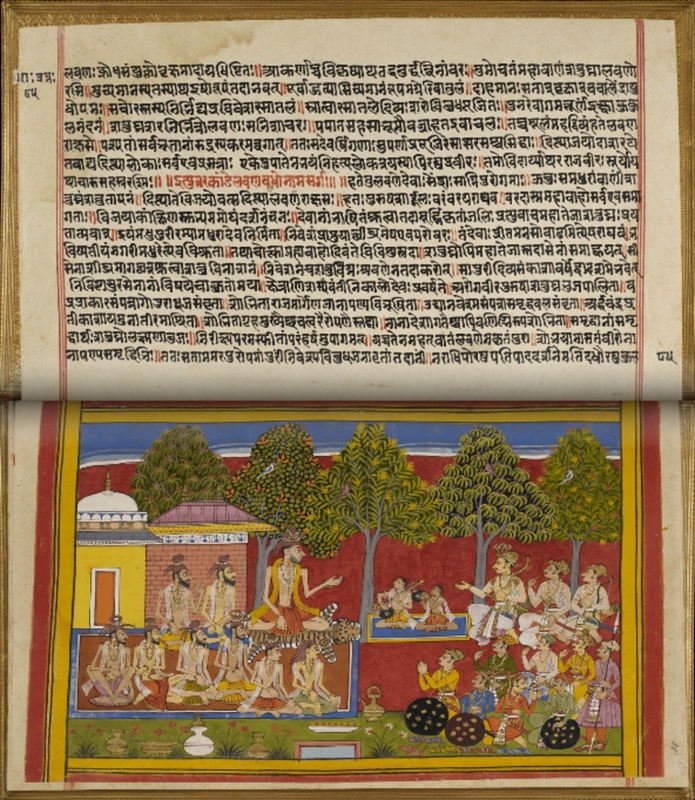 One such example is a richly illustrated manuscript of the Rāmāyāṇa, an epic Sanskrit tale, commissioned in 1649 CE by Maharana Jagat Singh (1628 - 1652 CE), the ruler of Mewar, now part of Rajasthan. This manuscript, which has over 400 paintings by three different studio masters, was originally divided into seven volumes. The British Library currently houses four complete volumes and one partial volume in their collection, while the remaining two are held in collections in India. Turning the Pages™ provides an exceptional platform for closely browsing these ornamented folios along with the Sanskrit text. Each page contains an audio and written description of the scene and a contextual summary of the story in English. Those familiar with this ancient epic tale know that it tells the story of the prince Rāma and the rescue of his wife Sītā after her abduction by the demon king Rāvaṇa. The earliest near-complete copy of the Bible: Codex Sinaiticus (the oldest surviving complete copy of the New Testament; the manuscript dates from around the mid-fourth century CE). Mozart's Musical Diary in Mozart's own hand. 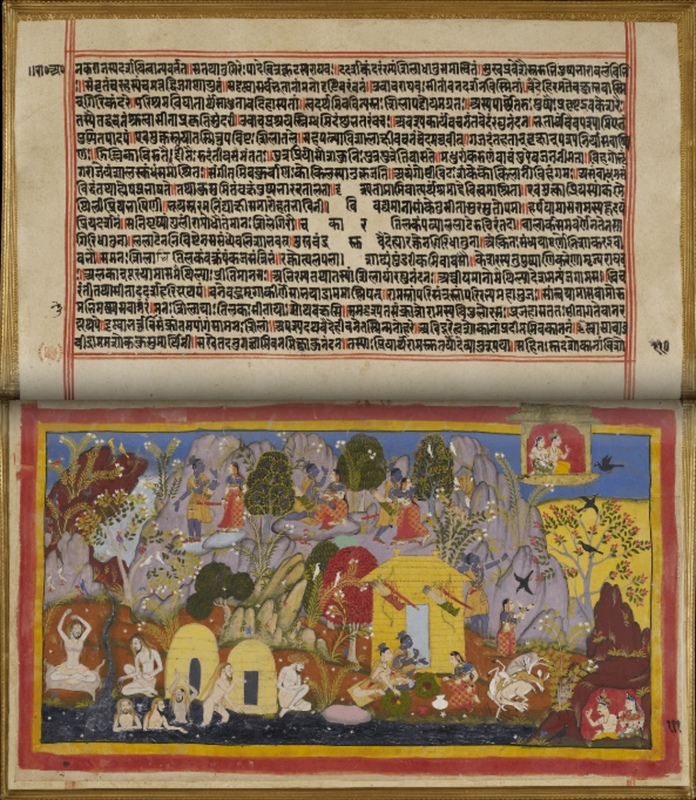 Below are a few of my favourite folios from The Mewar Rāmāyāṇa. Hanuman has flown to the Himalaya Mountains to gather medicinal herbs to cure Rama and Laksmana. Sugriva has been brought to his senses and has come with his court to Rama's cave on the Prasravana mountain. 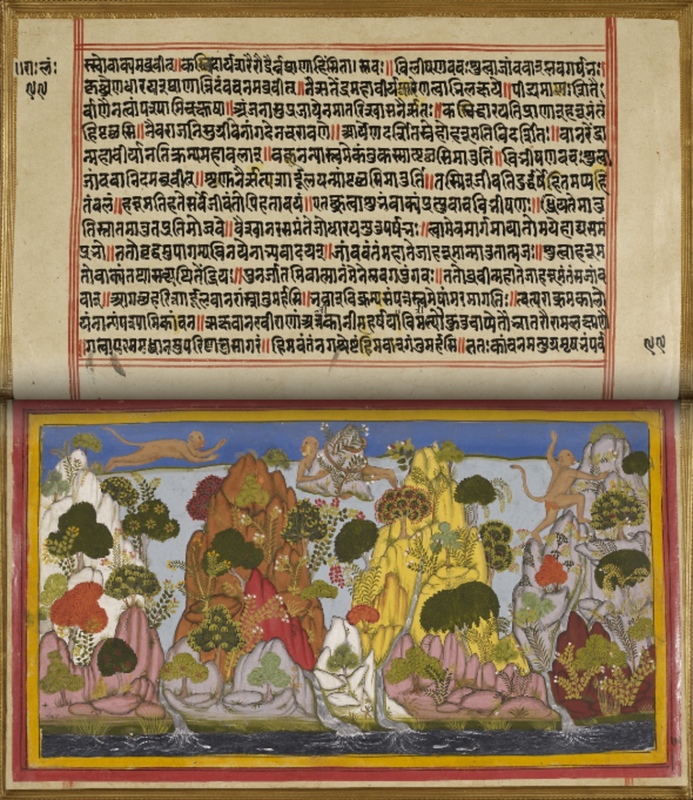 Rama, Laksmana and Sugriva are seated on a rocky eminence of pinky brown, with a jade background, with other monkeys below them. 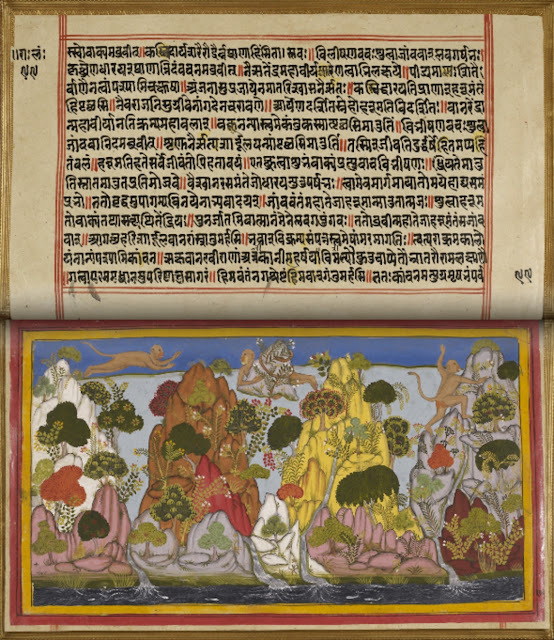 Rama points out beauties of the Citrakuta mountain to Sita. A group of ascetics pray, meditate and bath along the Mandakini river.